In the men’s bathroom at GA they have paper towels and for a long time the tiniest waste basket. Despite their best efforts to keep the place very clean, including the bathroom, it was becoming a rare occasion to walk in there and not see the waste basket overflowing with paper towels. Typically it would overflow, and there would be a bunch of paper towels all over the floor. It’s amazing how just that one thing would make the bathroom feel dirty, even though it is very clean. 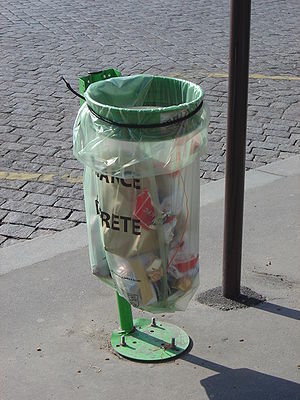 Why not just get a new waste basket, a bigger one that could easily support the daily use? Because it is one of those things that, although easily fixable, doesn’t really occur to someone until it’s full and by then you just want to fix the immediate problem instead of the “bigger” one. I know this is just a little thing, overflowing paper towels and a waste basket, but I realized there are a lot of “small waste basket” problems I put band aids on everyday. When I saw a new trash can at GA in the bathroom this morning, I had to wonder what those problems were and why I wasn’t looking to fix them in more long term ways. I think it’s because I’m often too distracted by something else to think about fixing them until they require my immediate attention…and then band aid until I need to address them again. I bet if GA looked at how much time and effort was expended to clean up the overflowing paper towels off the floor vs just buying a big waste basket from the beginning, they would have opted to buy the bigger can a long, long time ago (I doubt they are thinking about this at all…it’s a trash can). So I guess the question I’m left with, is how do I get better about noticing the “small waste basket” problems in my day to day work? There are more gnomes on Excel in the basement calculating the NPV of trash cans vs labor out there than you’d probably think.The problem is that some fucker still throws it on the floor. Best laid plans, etc.